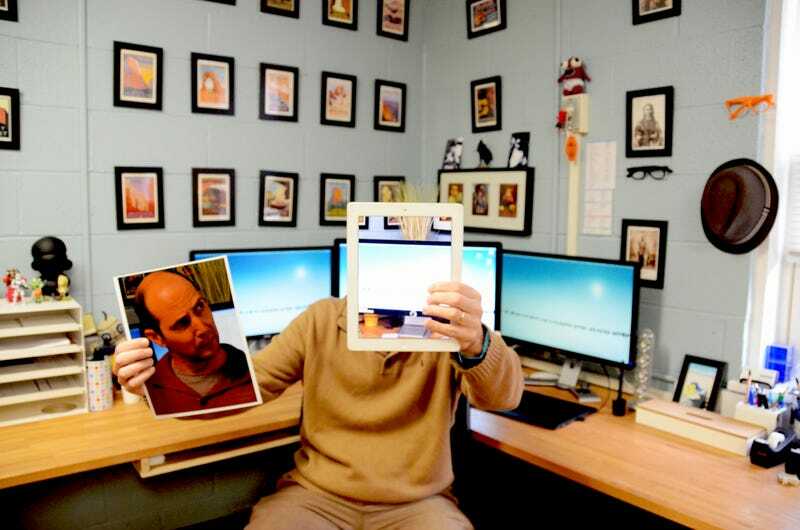 Man Swaps Head For iPad. Has No Regrets. This superb illusion doesn't use Photoshop. So how did photographer Nils Bertrand pull it off? In response to last week's Shooting Challenge, Nils was one of our only readers who took the bait—to take a photograph that itself contained a photographic illusion (basically, photo within the photo, held in place to replace part of the scene). Luckily for us, he nailed it using his iPad. First I took the close up [of my face] and printed on a glossy paper to make it pop out a little more than a matte paper. After I took the same picture without me in it to get the background image to put on the iPad. I had a colleague/boss (that would make her laugh) on the other side of the camera and we played scaling the image on the screen and moving the iPad around to position it so my head would be totally hidden and that image on the iPad kind of match the back. I wanted both images to have the same background so it looked like I removed the image from the iPad. I was really happy with the shot because it was the last shot that we made out of a total of 4, the first one was totally out of focus and the other two had my bold spot rising from the top of the iPad. Also we were doing this during working hours so we had to be quick to not get busted by our big boss. But I love the fact that I can do that in my office, it brings another element to the challenge. And a little reminder, if you like Shooting Challenges, we need you to not just lurk, but to participate! It's the tears of all of you, distilled into a potent alcohol and combustable that keep this machine running!